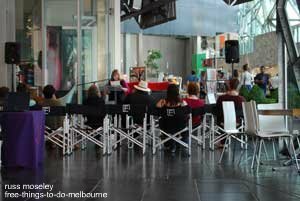 UPDATE: Poetry seems to have finished for the moment in Fed Square but check out melbournespokenword.com where you'll find some other free events. 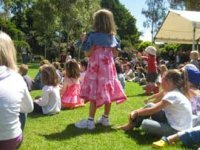 If you're a budding poet or just like listening to poetry, head along to Federation Square. At the time of writing this page it's held on the third Saturday of every month. 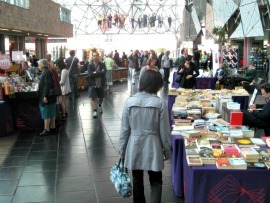 It's held in The Atrium alongside the Book Market. ....... Obviously it must have been a bit scary for me as it remains etched in my brain but I was voted into second place which isn't too bad in a Scottish school when I was actually born in England! Och aye!! Actually, Ive just been doing some research and I always thought it was a Robert Burns poem called Sair Wee Pinky but it's actually by someone called Walter Wingate and called The Sair Finger (The Sore Finger!). Oh well, that makes four poets I know now!! You've hurt your finger? Puir wee man! I get my specs and see! My, so it is - and there's the skelf! See there - my needle's gotten't out! I'm sure that wasna sair? Noo, there na - rin awa'! Row'd up the same as John! Aah, memories!! Does it make much sense to a non-Scotsperson I wonder? .......They're tucked away on the left hand side of The Atrium when entering from Flinders Street end. Just ask one of the book market stallholders if you can't find them........like I did! It's on for a couple of hours, from 2pm to 4pm. The link to double check the times haven't changed since I wrote this page is Federation Square. It's now in it's third year so is pretty well established. Each month there are two featured poets and up to ten open readings so just ask if you're feeling brave! Excuse my rather poor photo of the poetry group at the top of the page by the way but at least it gives you an idea of what goes on. .........The railway lines you can see on the map actually run underneath Federation Square by the way! Other things to do while you're in Federation Square are the highly interesting Federation Square Tour, the Australian Centre for the Moving Image, the Kids Activities at the Ian Potter Centre and the National Gallery of Victoria:Australia.